Description During the climb from a confined area on a hot day, the pilot received a low rotor RPM warning and was unable to recover. The helicopter collided with terrain resulting in substantial damage. The engineering inspector did not determine the cause. Description During landing, the aircraft encountered a wind change and ground looped resulting in substantial damage. Description During a touch-and-go, the aircraft ballooned and landed hard resulting in the nose gear collapsing and the propeller striking the ground. The aircraft was substantially damaged. Description During aerial work, the gyrocopter collided with terrain and the pilot was killed. Description The aircraft collided with terrain. The aircraft sustained substantial damage and the pilot and passenger received serious injuries. Description During a dual training flight, the engine failed, and the crew conducted a forced landing. The engineering inspection revealed there was a total of 15 litres left in the left fuel tank that failed to feed into the engine. It is suspected that a non-vented filler cap on the left-hand tank was the cause. Description During approach, the crew of the DG-505 Glider observed a Piper Aircraft PA-28 in close proximity on the same track. The PA-28 was then observed to conduct a go-around to maintain separation and the DG-505 continued their approach. No radio calls were heard from the PA-28. Description During a training flight, the crew of the Cessna 172 observed another aircraft tracking in close proximity on a reciprocal track. The crew of the 172 made a right turn to increase separation. Description During landing, the nose tyre burst resulting in the aircraft veering off the runway, the nose gear collapsing and both propellers striking the ground. The suspected cause of the tyre puncture was foreign object debris on the runway. Description During approach, the crew received an unsafe landing gear indication. On landing, the left-hand landing gear collapsed. The aircraft sustained substantial damaged and the pilot sustained minor injuries. Description The aircraft landed hard, resulting in substantial damage. Description During aerial agricultural operations, the aircraft struck a powerline resulting in damage to the rudder. The pilot returned the aircraft to the airstrip. 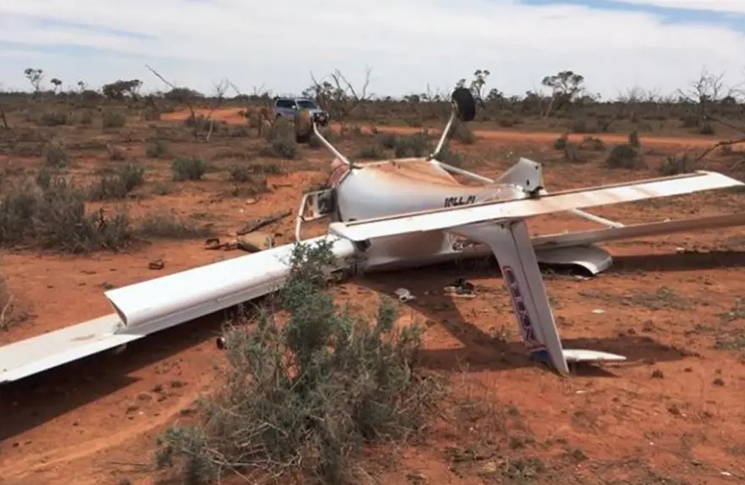 During landing, the pilot lost directional control of the aircraft, which departed the runway and collided with a tree resulting in substantial damage to the aircraft and minor injuries to the pilot. Description During take-off, the aircraft struck a wire and subsequently collided with terrain. Description During an out-landing, the aircraft struck a fence and collided with terrain. The aircraft was substantially damaged. Description During cruise, the aircraft collided with terrain. The aircraft was destroyed and the pilot, who was the sole occupant was killed. The investigation is continuing. Description During landing, the aircraft bounced, and the propeller and tail struck the ground. Pieces were observed separating from the aircraft resulting in substantial damage. Description During approach, the pilot was not visual at the minima and proceeded to land, resulting in a heavy landing. The pilot observed damage to the left propeller and was unable to stop the aircraft on the runway and conducted a missed approach. The post-flight inspection revealed substantial damage to both propellers. The investigation is continuing. All very serious, of course, but under Palm Island Aerodrome: “foreign object debris on the runway” … makes me wonder if there’s debris that’s not composed of foreign object(s)! The C152 fuel starvation accident at YBBK on 21 November is the second such recent accident involving the Cessna fuel venting system. The other was a C172 at Wondai ALA on 14 April. The system uses a common vent behind the LH strut which connects to both tanks. In case that is blocked, there is a secondary vent with a normally-closed check valve in the RH tank cap. These were a mandatory retrofit in early Cessnas but standard equipment on later production. The obvious question is whether we have now an emerging age-related problem with the Cessna tank venting systems?